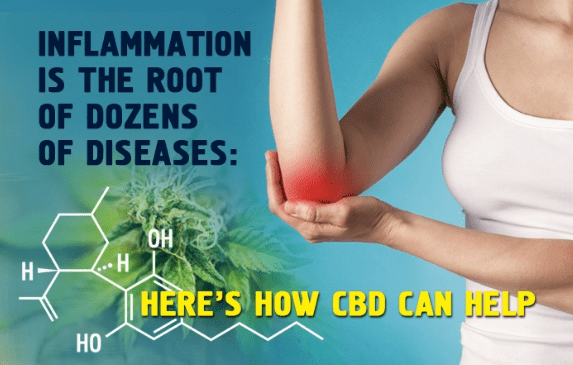 How Does CBD Tackle Inflammation in the Body? The immune system is the body’s first defense against foreign invaders like bacteria. This complex machinery includes a wide array of cellular and molecular factors that work together to keep the “bad guys” from infecting a healthy body.1 And, in most people, this system works quite well. Although many of us complain about the occasional cold, we’re actually quite lucky to avoid the multitude of potentially harmful microorganisms littering the environment that never make it past our fortress of immunity. In cases of a weakened immune system, resulting from either stress on the body or certain medications, you are more likely to acquire an infection. Most of us have experienced this after a few all-nighters of studying – once stress levels begin to drop, you get hit with a cold, as your immune system tried to get back online. How Does CBD Affect the Immune System? Cannabinoids have been evaluated for their safety and efficacy in treating multiple sclerosis, or MS, for several decades.11MS is a progressive disorder that causes potentially disabling motor problems, as well as other nervous system disruptions. Large clinical trials have shown that cannabis-based medications can help alleviate pain and improve motor movements.12,13 And several other trials are currently underway to further evaluate the effects of cannabinoids on MS.
Rheumatoid Arthritis, or RA, is a chronic autoimmune disease that causes inflammation throughout the body, resulting in painful swelling and joint stiffness. If you are a medical marijuana patient, be sure to talk to your dispensary and your doctor about different ways you can use CBD to treat your autoimmune condition. Yatim, K.M., Lakkis, F.G., “A Brief Journey through The Immune System”, CJASN, 2015, Volume 10. Wang, L., Wang, F-S, Gershwin, E., “Human Autoimmune Diseases: A Comprehensive Update”, J Intern Med, 2015, Volume 278. Kozela, E., Juknat, A., Gao, F., Kaushansky, N., Coppola, G., Vogel, Z., “Pathways and Gene Networks Mediating The Regulatory Effects of Cannabidiol, A Nonpsychoactive Cannabinoid, In Autoimmune T Cells”, Journal of Neuroinflammation, 2016, Volume 13. Srivastavaa. M.D., Srivasta, B.I.S., Brouhard, B., “Δ9 Tetrahydrocannabinol and Cannabidiol Alter Cytokine Production by Human Immune Cells”, Immunopharmacology, 1998, Volume 90. Nagarkatti, P., Pandey, R., Rieder, S.A., Hegde, V.L., Nagarkatti, M., “Cannabinoids As Novel Anti-inflammatory Drugs”, Future Med Chem, 2009, Volume 1. Klein, T.M., “Cannibinoid-based Drugs As Anti-inflammatory Therapeutics”, Nature Reviews Immunology, 2005, Volume 5. Richardson, D., et al., “Characterisation of The Cannabinoid Receptor System In Synovial Tissue and Fluid in Patients with Osteoarthritis and Rheumatoid Arthritis”, Arthritis Research & Therapy, 2008, Volume 10. Blake, D.R., Robson, P., Ho M., Jubb, R.W., McCabe, C.S., “Preliminary Assessment Of The Efficacy, Tolerability and Safety Of A Cannabis-based Medicine (Sativex) In The Treatment Of Pain Caused By Rheumatoid Arthritis”, Rheumatology, 2006, Volume 45. Wright, K.L., Duncan, M., Sharkey, K.A., “Cannabinoid CB2 Receptors In The Gastrointestinal Tract: A Regulatory System In States Of Inflammation”, British Journal of Pharmacology, 2008, Volume 153. De Fillipis, D., et al., “Cannabidiol Reduces Intestinal Inflammation through the Control of Neuroimmune Axis”, PLoS ONE, 2011, Volume 6. Rog, D.J., “Cannabis-based Medicines in Multiple Sclerosis – A Review Of Clinical Studies”, Immunobiology, 2010, Volume 215. Russo, M., et al., “Evaluating Sativex® in Neuropathic Pain Management: A Clinical and Neurophysiological Assessment in Multiple Sclerosis”, Pain Medicine, 2016, Volume 17. Zajicek, J.P., et al., “Cannabinoids In Multiple Sclerosis (CAMS) Study: Safety and Efficacy Data For 12 Months Follow Up”, J Neurol Neurosurg Psychiatry, 2005, Volume 76.